Search for the latest condos for sale in Emerald Grande in Destin, FL. Learn more about this community with our local Emerald Grande Guide. Explore other coastal communities or other Destin condos and listings. 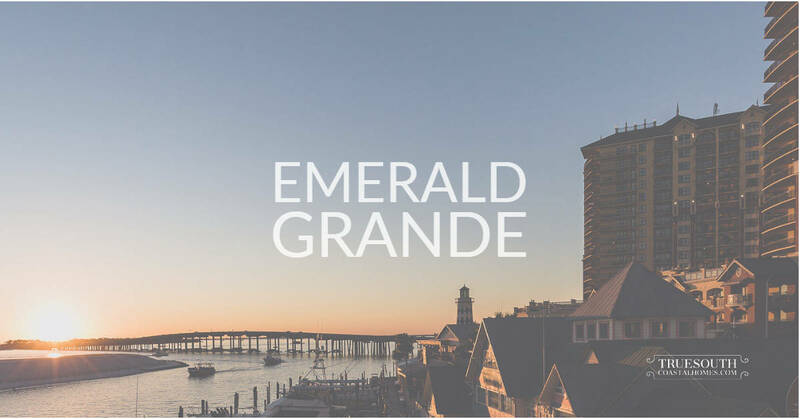 The Emerald Grande at the HarborWalk Village, the "Crown Jewel" of Destin, is a luxury high-rise condominium complex located at the mouth of the Destin Pass and the Destin Bridge. The 14-story tower enjoys epic panoramic views of Destin Harbor, Choctawhatchee Bay, Gulf of Mexico, Crab Island and Okaloosa Island. Each unit has a private balcony, some have two, to enjoy front row seats to stunning fireworks and glorious sunsets. There are various configurations of 2-, 3-, and 4-bedroom floor plans with 9’ ceilings. The grand 2-story lobby has a beautiful 15’ compass inlaid into the hardwood floors and a massive globe chandelier overhead. There are extensive amenities including, a 24-hr staffed front desk, concierge & room service, massive outdoor pool, and deck, indoor heated pool, hot tubs, spa with sauna, steam room & fitness center, business center, gift shop, restaurants & lounges, covered parking, two marinas, and kids club. Units are rentable and therefore provide an appealing rental investment opportunity. HarborWalk Village is just outside the Grande with many exciting opportunities for shopping, dining, and entertainment. From here, you can take a beach shuttle with beach chairs and umbrella and sunbathe and snorkel. You can even charter a fishing boat or rent jet skis and pontoon boats. The listings on this page include condos in the Emerald Grande in Destin, Florida. If you’re interested in scheduling a showing or learning more about any one of these homes, simply fill in your contact information and click the “Request More Info” button. Our team is here to provide you with any information you need, including disclosures, the sales history of a property and nearby market data. Destin is rightfully famed for its sugar-white sands and emerald-hued waters. And due to its plentiful and always hungry underwater population, Destin is widely known as the "world’s luckiest fishing village." Destin also harbors world-class resorts and rentals – and some of the best shopping and dining anywhere. Emerald Grande at HarborWalk Village is located on the beautiful Destin Harbor. Destin's Top 10 things to do at HarborWalk Village are counted down by Shane Reynolds of Color Earth Productions. Every thing to do in Destin on the Harbor is shared with you! Learn more about HarborWalk Village and discover what your 'thing to do' in Destin is!